Active Components: Horseradish is nearly identical to mustard in its content, as they belong to one family. Thus, it is rich in glycosides, isothiocyanates, and volatile oil. Horseradish is characterized by its antibacterial capacity, which makes it effective in upper respiratory tract inflammations, including sore throat. Glycosides promote skin reddening, when the herb is used as an external remedy, due to the fact that they increase blood supply to the area. History: Horseradish, characterized by pungent properties, has been applied in herbal medicine for a long period. Horseradish was known as a topical and an oral remedy. When spread over affected area topically, it caused irritation and increased the blood flow to the aching joints. As an internal medicine, it was applied to induce urination and treat edema or kidney stones. Additionally, it was applied to stimulate the digestive system. The herb was also beneficial for treating sore throats, coughs, and eliminating worms. Used For: The range of conditions in which Horseradish is applied includes sinus congestion, indigestion, sore throat, common cold, and bronchitis. The herb is known to induce urination, cause skin irritation, and promote stomach activity. Its diuretic capacity is beneficial for bladder infections, rheumatic conditions, and gout. Additional Info: Horseradish belongs to perennials and is indigenous to western areas of Asia and southeastern areas of Europe. Moreover, it is specially raised across the globe. The root is tapering or cylindrical and features a stem which may reach up to 3 feet in height. Its basal leaves are lanceolate in shape, with the stem leaves being sessile and serrate. 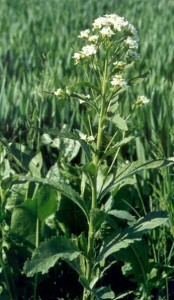 The blossoming period lasts through summer, when white flowers appear in panicles. Preparation and Intake: Fresh chopped root may be consumed at a dose of a half to a teaspoon thrice per day. In form of tincture Horseradish is applied at a dose of 2-3 ml thrice a day. Horseradish is efficient only in fresh conditions. Its roots may be stored in the fridge for several months after collection. Horseradish remedy may be made on vinegar, by adding chopped herb to vinegar and steeping it up to ten days. The common dose is one teaspoon twice or thrice a day, dissolved in water. The mixture may also be used as a topical remedy. In form of poultice the herb is spread over the affected part, with cloth, on which the extract is distributed, separating the herb layer from the skin. Remove when feeling a burning sensation. To make syrup take a teaspoon of root extract for half a cup of boiling water and infuse for two hours under a cover. Filter and sweeten it until forming syrup-like substance. To make the taste pleasant, aid the extract with honey or sugar. Bladder infections can be relieved by mixing 3-4 tablespoons of pounded horseradish with grape sugar and wine vinegar. To relieve intestinal conditions and colitis, asthma and coughs, horseradish is mixed with raw sugar and honey. Safety: Large amounts of horseradish may lead to excess sweating or vomiting. If applied to eyes or skin directly the herb may also lead to irritation. Hypothyroidism is another contraindication to the use of horseradish.